For a lot of people, convenience is the deciding factor in making purchases in the tech world. Being able to access what you want when you want it is huge, and in the world of vinyl, a big part of the convenience factor is speaker systems. 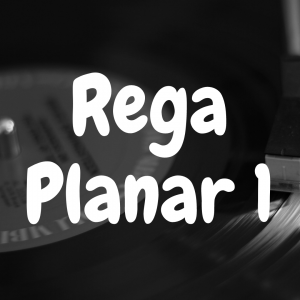 It can be daunting to figure out if you need to buy a pre-amp, whether or not your speakers or active or not, and then you have to find a way to connect them to the turntable, and depending on RCA hookups or traditional sound system wiring, it may be more work then you want to deal with. The best turntable for you may be one with built-in speakers. 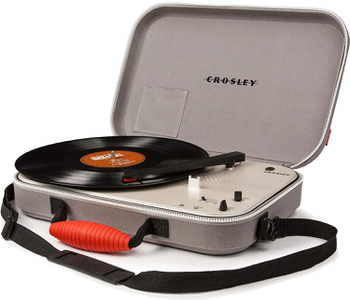 And that’s why, in today’s article, I’m going to discuss and recommend the best portable record players with built in speakers. In fact, to better help you, I encourage you to check out the interactive guide below, which lets you compare some of the popular record players with speakers against one another. I’m always the first to push back against elitism in vinyl culture. A lot of people will argue that built-in speakers aren’t worth it because they take away from sound quality and experience. 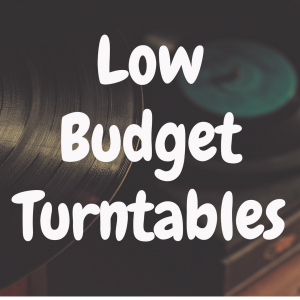 While you may not be able to get a perfect sound with built-in speakers compared to an elaborate set-up, you can purchase solid turntables with built-in speaker systems, all the while keeping your wallet from draining itself empty. 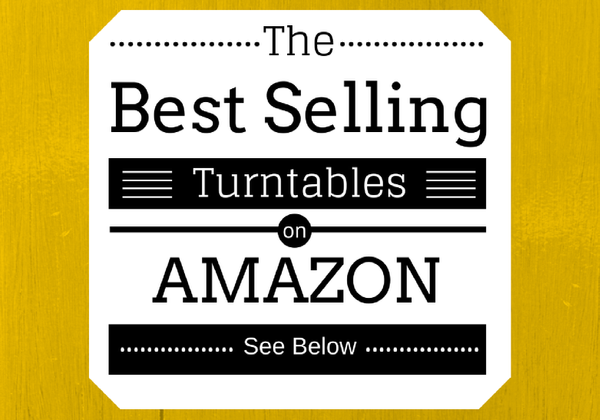 Before I get to my recommended players, please take a moment to view some of the best selling record players on Amazon, and then see how well they stack up to the turntables we discuss in depth in this article. Let’s begin with a record player made by Jensen. 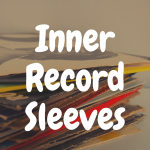 Most individuals starting their journey into vinyl records will come across this, and many look right past it thinking that the price is too low for their to be any remnants of quality. I’m a firm believer in pushing back against pretentiousness in the record collecting world, and I am happy to say that the backlash against the Jensen JTA-222 is unwarranted and overblown. For under $50, you get a great turntable with built-in speakers, and a lot of different ways to play records the way you want to. Jensen electronics dates back to 1915 with founder Peter Jensen’s invention of the loudspeaker, a device through which sound could be broadcast to a large crowd within a confined space. Jensen became the go-to for audio systems in vehicles through the 1980s and 1990s, most popularly found in Jeep vehicles. In 2004, Audiovox added Jensen products to their line of audio equipment, including the popular Jensen turntables that were known for their affordability and bang-for-your-buck aspect. The JTA-222 is no exception to Jensen’s history and reputation for defining quality in the audio world. The JTA-222 plays at 33 ⅓, 45, and 78 RPMs, making it a turntable that can play anything from any time period. For those unaware, 78s were the records originally pressed for the original phonograph, so an older neighbor or family member may have some collecting dust in an attic somewhere that you can spin on the JTA-222. For the three play styles alone, this turntable is a great introduction for those who haven’t spent much time in the world of vinyl. Built in speakers are a great option for on-the-go listening, and if you decide to pick up a pair of bookshelf speakers, an output option is available on the JTA. A built-in radio with both AM and FM capabilities expands your listening options, and despite being a budget turntable, the sound quality on the radio and record playback is superb. The speakers fill up a small room nicely, so setting this up in a bedroom or living room is ideal. The design of the table is also a nice balance of retro and modern, highlighted by a wood-colored front panel with a throwback to the design of old radios to display the AM/FM dial. The table is relatively light, making it perfect for listeners who might be taking their music with them. Another style of turntable that is popular with newcomers is the suitcase-style table. 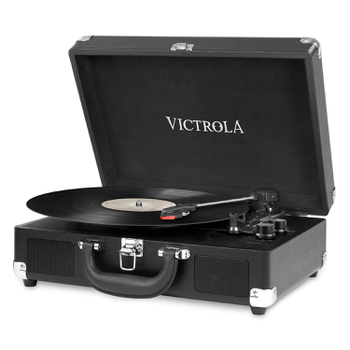 Victrola has been a common name within the suitcase turntable world for some time now, and for good reason. 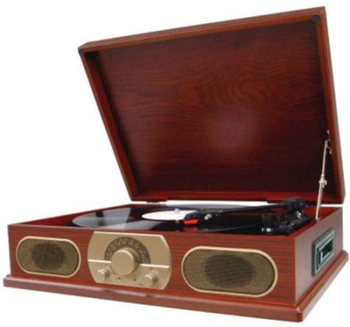 The Victrola Bluetooth Stereo Turntable comes in a variety of colors, and offers the option to play a number of types of records as well as devices connected through bluetooth. With the Victrola, vinyl heads get a lot of options in a compact turntable. For 110 years, Victrola has been in the conversation of turntables and audio equipment. Much like the Jensen name, Victrola is known for their compact, durable turntables that are friendly to the bankroll and simultaneously worth bragging about. Bold and retro, Victrola often goes one of two ways with their designs, colorful and modern or sophisticated and timeless. While some of their tables are great for home displays, the Bluetooth Stereo Turntable is designed to be moved, featuring a handle for transportation. Despite being portable, the Victrola Bluetooth Stereo Turntable is far from just a transportable turntable. A semi-automatic tonearm is an nice touch, allowing for a return to the resting position without any manual movement of the rig itself. 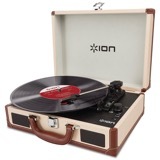 As the name suggests, the turntable is in stereo, which is not a given with all suitcase turntables. Both channels allow for dynamic playback as the artist intended, that is of course if they recorded in studio, which many artists did not before the 1960s. That being said, you can play music from well before the 1960s with the option to spin records at 33 ⅓, 45, and 78 RPMs. A headphone jack is available for personal listening that won’t disturb others, and an RCA output allows for external speakers should you choose to ever add them. 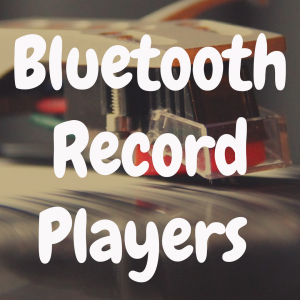 Plus, like the name suggests, bluetooth devices can connect to the Victrola and transform your turntable into a bluetooth speaker. As mentioned before, the multiple color choices are a great addition to the turntable’s benefits, seeing as you can really pick whatever color suits your environment’s design and theme. Personal favorites of mine in this Victrola colorway are velvet black, camouflage green, and cobalt blue. Nostalgia is the name of the game with the Studebaker SB6052, but the retro design to this sleek turntable is accompanied with modern listening options, an impressive speaker, and portable design. The first thing to take away from the SB6052 is its design and style. Studebaker are very much going for the turntable designs of yesterday, and they do it so well that you’d think that it could very well be a table from the 60s or 70s. The nostalgia is carried out well with this table, and that’s impressive coming from the relatively new Spectra company that only has 40 years to its name. I say only 40 because our last two turntables came from brands that have been around for what seems like forever, but luckily for Spectra, an international group of minds from the United States and Hong Kong with decades of experience in the industry are behind their products. It’s worth mentioning to that Spectra’s owner, Patricia Schoenberg, is a member of the WBENC that celebrates women-owned companies, and the inclusive, diverse minds that go into making the Studebaker help contribute to its greatness. The SB6052 has modern features despite its retro design. You can see from the front of the turntable that it has radio functionality at both the AM and FM frequencies, as well as two 2” speakers that pack quite a punch. The table also plays, yet again like its predecessors in this article, at three speeds encompassing all eras of vinyl records. Rotary volume controls help make volume adjustment a piece of cake, as well as adds a nice aesthetic to the table’s face. To my surprise upon checking the turntable out firsthand, the SB6052 also features a cassette player in the right side of the cabinet, meaning you can play cassettes as well as records, on top of the AM/FM radio design. That’s an added bonus, and cassettes play just as well on the Studebaker as one could hope. Not to mention that all of this comes for a price that hovers around $72. Crosley is notorious in the built-in speakers world of turntables, and some of that garners them some flack from more seasoned vinyl heads. Luckily, the criticisms of Crosley are often unwarranted, and if you’re looking for built-in speakers because you desire portability, it doesn’t get much more portable than the CR8016A. At under 5 pounds, this table goes where you go, and it takes almost no effort to bring it there. Literally called the Messenger turntable, the CR8016A resembles a messenger bag in size, shape, and style. Closed and contained, this turntable looks as if you may have a laptop or some folders inside of it, and the handle as well as the shoulder strap mean that you get to carry your turntable your way, all the while keeping your cargo relatively discrete. The table touts a diamond stylus, ensuring durability in case something happens when you’re taking your turntable to a new listening spot. The speakers themselves are built-in and despite being contained within a compact space, they sound as if they have all the room in the world to project. While this table might not fill up an entire living room with sound, a bedroom or office would be well-equipped to handle the sound the CR8016A brings. With stereo sound, the small, confined space within which the speakers rest are more dynamic than meets the eye. 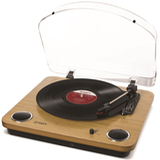 The CR8016A also spins at three speeds, 33 ⅓, 45, 78, meaning all records are fair game on the Crosley Messenger turntable. There isn’t much this table can’t do in terms of an enjoyable vinyl experience, and when you decide you need a change of scenery, the CR8016A is ready to move with you. The BT-17DJ is a true stereo experience with both built-in speakers on each side of the table’s 15 inch cabinet. Out of all the turntables in this list, the Boytone is the most accurately recreated external speaker turntable experience. The BT-17DJ is a sleek black, but can be purchased in different colors on the Boytone website. With an RCA port for speakers should you choose to add external sound, AM/FM radio, a USB slot for digital music, and an auxiliary input for MP3 devices and phones, a lot comes with the stereo experience of the Boytone turntable. The BT-17DJ is a three speed turntable, spinning at 33 ⅓, 45, and 78 RPMs, which is great for all formats of vinyl. 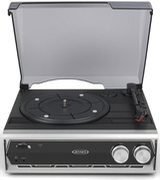 As stated above, the turntable also plays AM and FM radio. 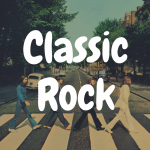 If you’re in the mood for more modern formats of music listening, USBs can be inserted and played as long as they’re in MP3 format, and an auxiliary cord allows for MP3 players and phones to be plugged in and played. With so many options and methods through which to listen to your music and media, the BT-17DJ is a great option for those looking for built-in speakers that can play more than vinyl records. The one caveat to the numerous listening options is the volume of the table itself. 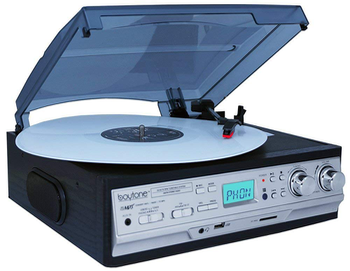 A bedroom could easily be filled with the Boytone BT-17DJ but don’t expect to rock out. The volume on the turntable is lacking that punch required to fully blast an album or song, but for listeners looking for a table that can play their records at a level that allows for conversation or other focuses, the BT-17DJ does just fine as a turntable in a small room. Verdict: Can you blast 80s hair metal or hip hop records on this table? No, but the Boytone BT-17DJ has multiple options for listening, a stereo turntable configuration, and a great deal of style. There you have it! 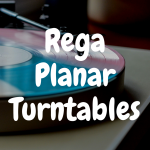 All the turntables mentioned above are solid options, and now it’s up to you to figure out what you’re looking for in a built-in speaker turntable! A few years ago, built-in speaker turntables meant that you had to sacrifice quality for convenience, but as I’ve laid out, that’s not longer the case.